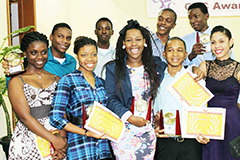 The National CXC Awards Programme was initiated in 2003 from a recommendation by the Caribbean Examination Council (CXC) that Ministries of Education in the territories served by the regional examination body celebrate the achievements of students who successfully sit the May/June session each year. It is intended to serve as an extrinsic motivator for excellence. 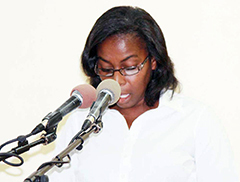 The Ministry of Education, Youth Affairs and Sports celebrated the achievements of 34 candidates who wrote the 2013 May – June CXC, CSEC, CAPE and CCSLC examinations, while they were students at the Montserrat Secondary School (MSS) and Montserrat Community College (MCC), at its annual CXC Awards Ceremony on Tuesday, February 25, 2014. 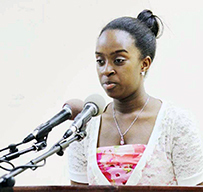 The ceremony was held at the Brades Arts and Education Centre witnessed an MSS Student Alicia Richmond who opened with an invocation, followed by Miss Meredith Lynch with a Welcome and introduction of Chairman Permanent Secretary Phillip Chambers of the Ministry of Education. In his chairman’s remarks he spoke of the significance of the event and gave warnings and en couragement to the students. He told the students, parents, supporters and invitees: “This evening would be recorded in the annals of history as our small, powerful, resilient nation makes the paradigm shift, which would help us to take our place in a world where change is the only constant thing…we remain fully focused on the improvement of the most important factor for our country’s development- our human capital. 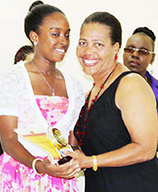 Nadia Browne was the 2013 Most Outstanding student in the CSEC Examinations. 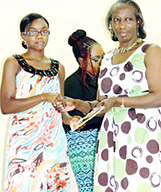 She gave reflections on achievement on behalf of the awardees. 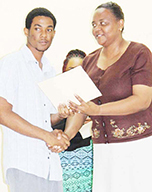 In the feature address delivered by the Minister of Education, the Honourable Colin Riley he urged the 34 awardees not to look back but instead go forward with their talents and make improvements every day. He noted that as he reminded of several points made over the years, this was one of the messages he has been bringing to the students. The Minister also used the opportunity to encourage the current students who will be sitting exams this year to do their best, applauding the awardees while encouraging them to improve daily. 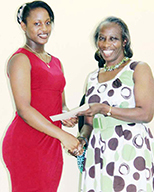 Miss Althea Alle n, Head, Upper School at the MSS and Miss Edella Allen, Clerical Officer in the Ministry delivered the citations. 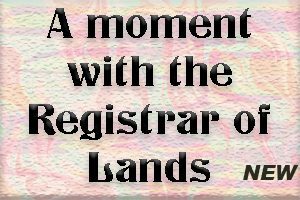 5 Subject Passes: Wendell Barry, Jervian Boatswain, Lyncia Hoyte, Junicia Irish, Julian Munroe, Kaysie Ryan, Nerissia Wallace, and Clefus Weekes Barzey. 6 Subject Passes: Bridget Collins, Odessa Henry, Branford Lee, Seon Richards, Celine Ryan, Ke-Shawn Thornhill, Shaquann Wade, and Tezinia Woodley. 7 Subject Passes: Brian Fenton and Craig Ryan. 8 Subject Passes: Sharese Allen, Ora Buffonge, Darion Darroux, Maria Figueroa, Kahleah Halloran, Kendell He rcules, John Jeffers, Korey Lee, Darius Lewis, Clarensia Piper, Samisha Samuel, Vanice Tuitt, and Sovanyé’ White.